Hey! 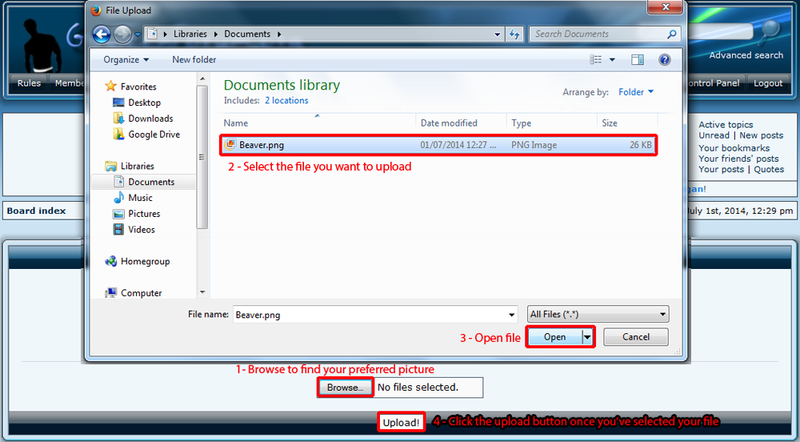 Just making a quick reference thread for new users who struggle with understanding how to use the Image uploader, and how to properly post an image. You'll find yourself redirected to another page looking something like this. You must have the picture file saved to your computer in order to upload it. Follow the standard procedure that you are more than likely already familiar with. Posting an image is rather simple. First you will need to find the image location of the picture you're trying to post. 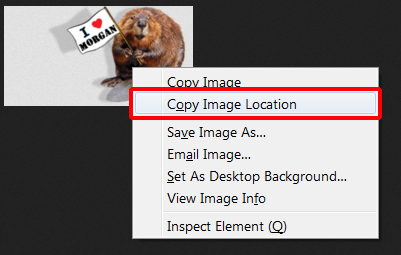 If you're using firefox, just right click any image and you'll find "copy image location" feature listed. If you're using Chrome, right click->copy image URL. My apologies if this quickly put-together guide doesn't help you at all. If you need further help, or have any questions, feel free to message me here. Morgan, I feel like a copy of this thread should somehow go to self-pics too; as that tends to be the place where the most confusion occurs. Wonderful. I'll still probably use another image hosting website. I find it ironic that you chose to post beaver shots on a gay forum. Isn't this thread already a sticky? You'd have to be obtuse not to figure it out anyway. It's not particularly hard to navigate. I thought the idea was to phase out the image uploader? Egregious wrote: Isn't this thread already a sticky? Oh this is lovely! I just made this as a quick reference for the numerous amount of people who ask me every week. Russell wrote: You'd have to be obtuse not to figure it out anyway. It's not particularly hard to navigate. You'd be surprised how many people don't actually know how to do it. Muammar wrote: Wonderful. I'll still probably use another image hosting website. Oh definitely, I use my Imgur account for just about everything I post here. Maybe people that obviously can't read don't belong on the internet at all. Morgan wrote: Hey! Just making a quick reference thread for new users who struggle with understanding how to use the Image uploader, and how to properly post an image. thanks for making the thread, its a big help! This post was deleted by TheBrunswickian on 29th July, 2018, 7:10 am. This post was deleted by Woollyhoolly on 30th July, 2018, 7:18 pm. This post was deleted by Woollyhoolly on 30th July, 2018, 7:12 pm. This post was deleted by TheBrunswickian on 31st July, 2018, 7:18 am. This post was deleted by TheBrunswickian on 1st August, 2018, 1:55 am. This post was deleted by TheBrunswickian on 3rd August, 2018, 12:48 am. This post was deleted by FirePhantom on 17th August, 2018, 6:14 am.